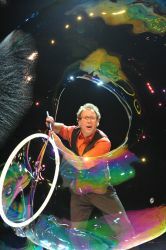 Louis Pearl has been thrilling audiences around the world for 30 years with the art, magic, science and fun of bubbles. An Edinburgh Fringe favourite, he has sold out every year for the last seven years. Louis explores the breath-taking dynamics of bubbles, combining comedy and artistry with audience participation and enough spellbinding bubble tricks to keep everyone mesmerized. From scultural bubbles, illuminated bubbles, bubbles inside bubbles, fog-filled bubbles, giant bubbles, bubble torcanos, and trampolines to people inside bubbles, the Amazing Bubble Man conjures shrieks of laughter and gasps of amazement from all ages.